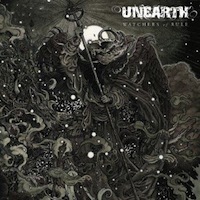 What can we say about UNEARTH. Like any ketchup or any other Metalcore band, you can love them or you can hate them. The American band that formed in Winthrop, Massachusetts, 1998, reached to a five nice albums and one incredible album that called "The March". The band earned to herself a place in the new wave of American Metalcore bands with work with a lot of great artists including the legendry Adam Dutkiewicz from KILLSWITCH ENGAGE, who for the first time in a while has not produced their album. The album starts with a short and good guitar's intro that lead us to the lead single and the first song in the album, "The Swarm". The song depends itself over fast solos and the tempo of the song that coming over the quality of the song. I don’t know why the band chose it as the lead single, but its not a very good start for the album and one of the worst singles that the band ever released, it's just a single that repeating itself very exhaustingly. The thing that worried me, is if this song is the lead single, then its means that the all album is like this? I hope not. "Lifetime In Ruins" is a lot better, and it’s got a great intro and sounds more like UNEARTH, but it’s not something exiting or addictive. "Guards Of Contagion" is actually the best song in the album. Why? Simply because it’s a song that we can hear that UNEARTH wrote. The fast growls that touching the Nu-Metal and the melodies that get crushed with the Trevor Phipps genius growls. But then we are coming from the best to the worst. From “The Tombs Of Five Below" is not doing a thing except.. well that it’s not doing a thing, it simply contains itself and just sounds the same in all of it’s 3 and a half minutes. "Never Cease" is an interesting and very fascinating song. It’s a problem and also its advantage is that it contains parts that can be part of "Guards Of Contagion". "Trail To Fire" is also a song that sound like UNEARTH. A hard Metalcore song with a great guitar's solos, fast drums, hard bass and addictive sound. But unfortunately, "To The Ground", "Burial Lines"," Birth Of A Legion" are not very interesting. They are songs that that just sound all the same, and my feeling is that the band hasn't invested a lot in them. In the bottom line, the album got a few nice songs, but the general feeling is that this is an album that the band hasn’t invested a lot in it. UNEARTH are very talented and some things that they are doing comes naturally and this is why there are some great songs like "Guards Of Contagion", "Trail To Fire" and of course songs from other albums. But also my feeling is that the band saw that the time has come to release a record and they did everything fast just to release another record in time and to get done with it. But what happened to the genius songs that make you think. In summary, the album got some good parts but the band's passion to writing songs are not doing well in this album.